There’s something in city dwellers that begs to be breathe in country air every once in a while. Growing up in Dublin, dotted by parks and plonked gently between the foothills of the Wicklow mountains and the Irish sea, I didn’t feel a desperate need to fill my lungs with clean air. Living in Hanoi for a year however, saw me gasping for green hills and open spaces. The city, for a large portion of every season, is drugged under a haze of smog, and the Vietnamese and expats alike frequently venture out to the countryside to rejuvenate and refresh. I took a long weekend off from my teaching gig in a skyscraper to visit SaPa in northern Vietnam. I craved the tumbling rice terraces and river valleys, the likes of which graced the pages of Nat Geo magazines and travel agency windows. A night bus saw me sandwiched between two Vietnamese couples, as the smoggy city gradually disappeared behind us. I woke up to a blindingly busy Sapa town, rampant with tour buses, local guides and dozens of ethnic tribes ready to hard sell their wares to travel weary tourists. The region is rapidly developing. It’s splattered with hotels in mid-construction, bars and souvenir shops. Everywhere you look people are selling the brightly coloured handcrafts and beautifully woven tapestries the region is best known for. I got out of there as quickly as I possibly could, determined after months of driving door-to-door on the country’s favoured mode of transport, to finally stretch my legs. I walked the three hours, motorbike-less, to my homestay. I was accompanied by an eager Hmong tribeswoman with gaping earlobes and a face leathered by exposure to the sun, who happily trotted alongside me and nattered away at me until I bought a souvenir from her. My homestay, run by a tech-savvy woman named Hoa (I found her on Facebook), was beside a river which gurgled away like a happy baby all day and night. Immediately on arrival I was surrounded by girls, all aged between 5 and 9 who pestered me relentlessly. “You buy from me” was their chorus, and luckily I had been warned not to purchase until I was leaving, otherwise the word would quickly spread between the brightly dressed sale mongering munchkins that I was an easy sell. Hoa dispersed the little ladies, inviting me inside to help cook dinner. “Aisling, you help make the dinner, yes?” she grinned at me while pointing to a live chicken whose head was soon to be parted from its body. She put me to work rolling spring rolls while the chicken’s head rolled, and I chatted with other guests staying at the homestay. After a feed and a substantial amount of rice wine I had one of the best sleeps of my life on a mattress on the floor. The next morning, fuelled by a banana pancake feast, I went for my first hike, accompanied by two others, a local guide and one of the coy little ladies from the day before, Mang. I was left in awe as she sprang along the uneven paths in plastic slider flip flops, traversed over gates and walls and galloped between thick bamboo groves with the ease of a mountain goat. She was 7 years old, unaccompanied, and didn’t have one sip of water for the 10 kilometre hike. 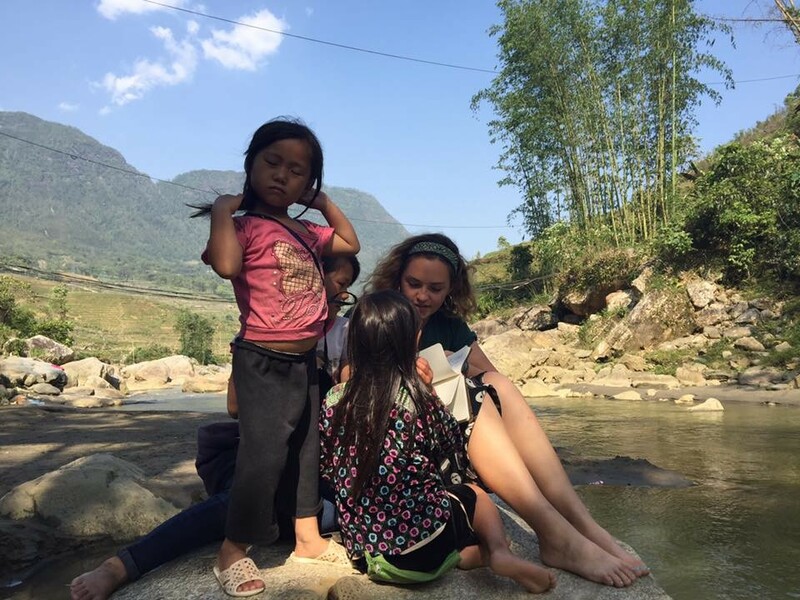 She zipped around me while I breathed in the incredible sights and sounds of SaPa; from beautiful brown-skinned ox cooling down in puddles, to staggered rice paddies that combed around each hill. When we finally descended dusty rocks towards the river at the heart of the valley, it was time to relax. The local children played by the river, peals of screaming and laughter as they jumped into the water and used discarded bottles to float, some of them buck naked and others still fully dressed. Mang followed me with two of the other girls as I dipped my aching feet and chatted with them, while they still peppered our chats with pleas to “buy from me”. I thought for a moment about being 7 years old, how on Fridays I would go for swimming lessons after 6 hours of school. I thought of my 7 year old students, back in the skyscrapers of Hanoi, diligently attending their expensive after-school programs. They were learning in different ways. This content has been entered in the Erasmus Travellers Competition and have earned 442 points. Share your Erasmus Experience in University College Dublin! If you know University College Dublin as native, traveler or as exchange student... share your opinion on University College Dublin! Rate different characteristics and share your experience.